Did you know that you can get a check for using First Medical Suite and then meeting the requirements for Attestation for Medicaid or Medicare? Use the links below and begin applying for Attestation and Meaningful Use Certification. You can get a series of checks from the Federal Government, if approved, and we have the Medicaid and Medicare Attestation pages and links below. 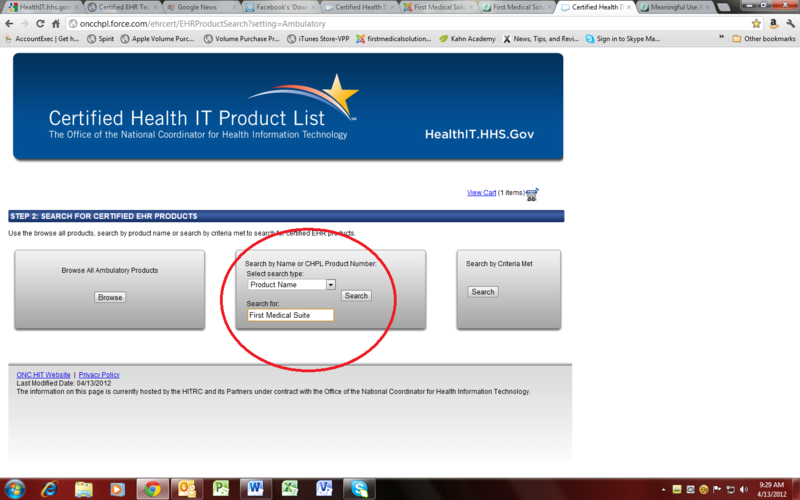 Simply go to the links and use the step by step forms to file for Meaningful Use Attestation approval. If your Practice is approved, your practice could receive thousands of dollars in incentive funds. But now is the time to act while the window of opportunity is still open. 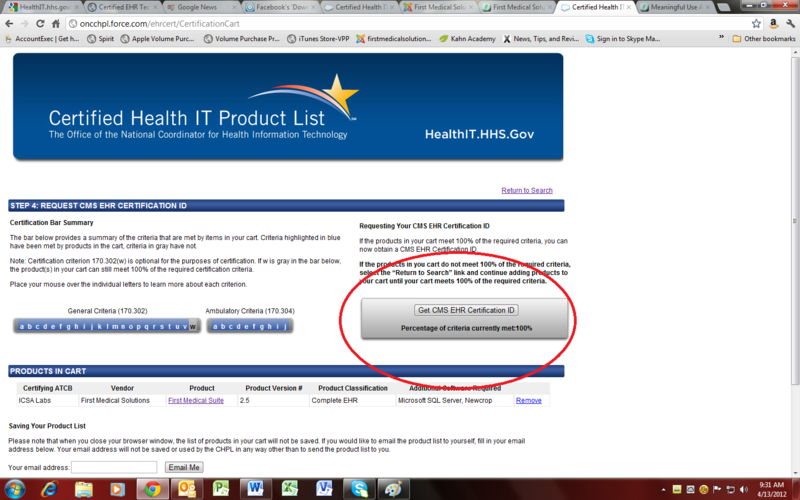 This Online tool from the US Government allows you to see if you meet the requirements for the Incentives Program and Meaningful Use. A simple way to determine quickly your eligibility for Attestation and a check for using a certified EMR like First Medical Suite. 4) You have to click on the right side of the table in the red circle that says one of two things "Add To Cart" or "Already in Cart". 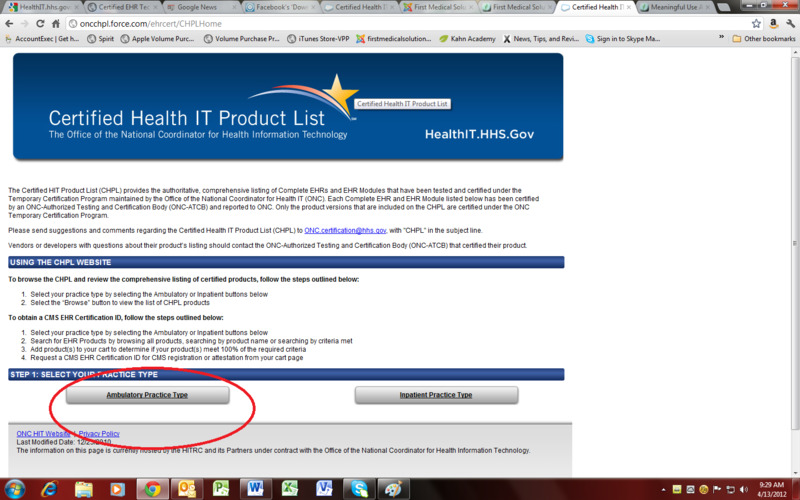 6) Your specific Certification ID for First Medical Suite will appear as above in the red circle. Do not try and use the Certification ID above. 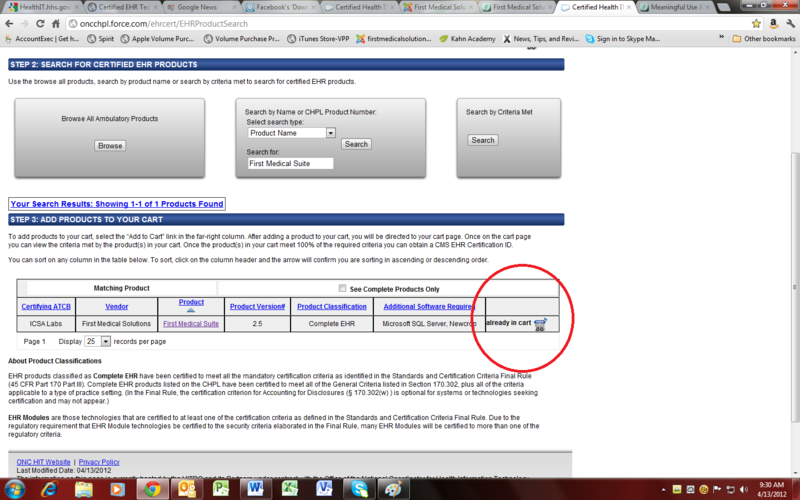 You must obtain your own specific ID for your practice to use on the Government forms. So either copy and paste this number or be sure to write it down. You will be asked for it in your application process. 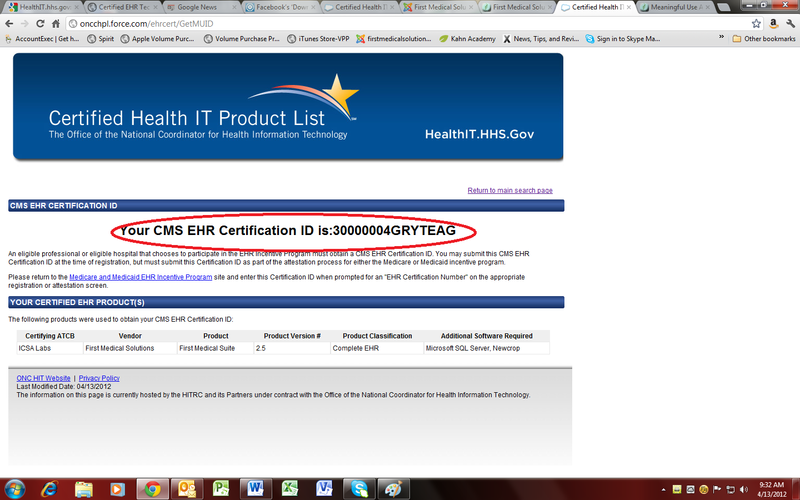 This number proves that you are using a certified EMR that is Meaningful Use ready. Don't delay. Register your practice immediately after FMS has installed First Medical Suite at your location. There are real cash paybacks and the incentive checks will be issued to those practices who meet the qualifications for Attestation and use First Medical Suite EMR. Checks usually take from 4 to 5 weeks to arrive. The wait may be sooner or later depending on the US Government who issues the incentive money. To even be considered for this incentive program, you must take the steps listed in the above links and follow all of the instructions they give for completion.